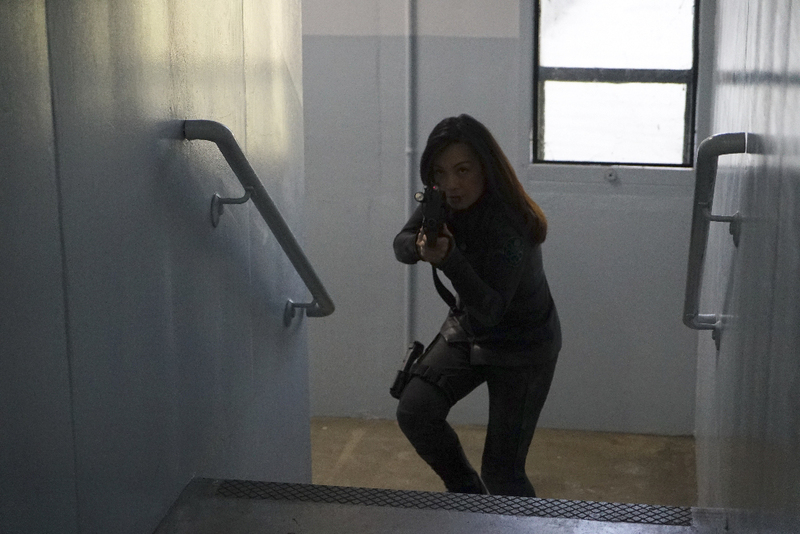 Preview images and spoiler description for the Marvel's Agents of S.H.I.E.L.D. episode "No Regrets"
“No Regrets” is the title of the Tuesday, April 18 episode of Marvel’s Agents of S.H.I.E.L.D. and ABC has released a very short description and some preview images to promote it. The truth behind Fitz’s turn could bring down all of S.H.I.E.L.D., on “Marvel’s Agents of S.H.I.E.L.D.,” TUESDAY, APRIL 18 (10:00-11:00 p.m. EDT), on The ABC Television Network. Three preview images can be found below. Marvel’s Agents of S.H.I.E.L.D. stars Clark Gregg as Agent Phil Coulson, Ming-Na Wen as Agent Melinda May, Chloe Bennet as Daisy Johnson, Iain De Caestecker as Agent Leo Fitz, Elizabeth Henstridge as Agent Jemma Simmons, Henry Simmons as Agent Alphonso “Mack” MacKenzie and John Hannah as Holden Radcliffe. Guest starring are Brett Dalton as Grant Ward, Jason O’Mara as Jeffrey Mace, Jordan Rivera as Hope Mackenzie, Patrick Cavanaugh as Burrows, David O’Hara as Alistair, Adam Kulbersh as Kenneth, Taj Speights as Burnell, Skyler James as Chris Adler, Beau Bonness as Hydra gate guard and Christopher Showerman as Hydra soldier. “No Regrets” was written by Paul Zbyszewski and directed by Eric Laneuville.